If you are a Funko POP hunter or just love inexpensive figures, Kingdom Hearts fans should be excited for the upcoming wave of Funko POP figures rumored to be arriving this year0. 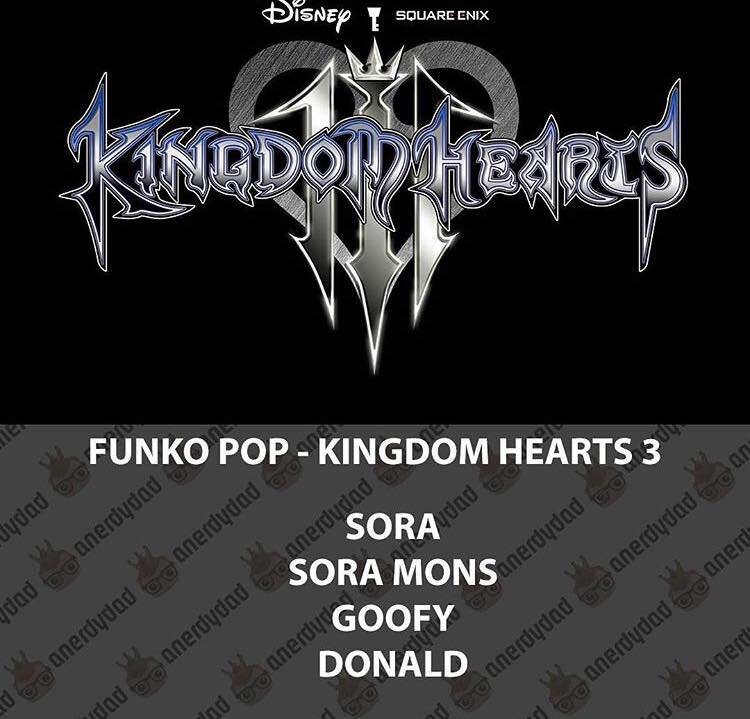 Via anerdydad and popcurated, listings for Kingdom Hearts 3 Funko POP figures appeared for Sora, Donald, Goofy, and "Sora Mons" (most likely meant to be Sora's Monsters Inc. form). Please note that no Funko POP figures have been officially announce by Funko at this time. Update: Popcurated have announced four more listings for Kingdom Hearts III Funko Pops. 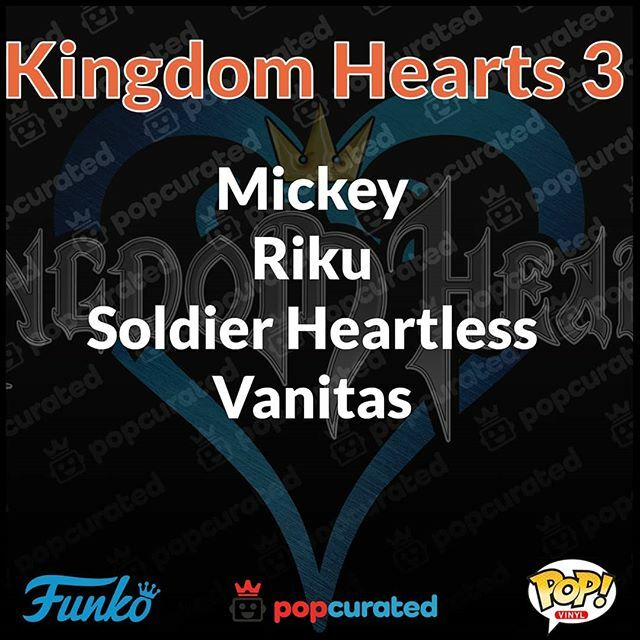 Mickey, Riku, Soldier Heartless, and Vanitas have both been teased to get the Funko treatment alongside the four pops listed above. However, Funko still have not confirmed the existence of these Pops. I'll definitely get the monster forms since I dunno if we will ever get more products of them. But I'm curious if they are just changing Donald and Goofy's poses a little and trying to sell them again lol. I still see some of the original wave around, so its not like they are off shelves already ha. They overproduced. A lot of people bought them, but they didnâ€™t have them strategicly placed. Like if they could have gotten Disney Parks & Resorts and the Disney Stores to take some of them, they likely would have gotten more exposure. But it is fine because most of the leftover Pops should sell with the new ones. So that's who the 13th vessel ended up being. At first glance that's EXACTLY what I thought as well lol. I guess they could just do that, but it would be suspicious we are getting monster Sora instead of Toy Sora then. Maybe there are more than just these 4 though. In fact, I guess that sounds likely lol. So did I! dang it! i really want to see what she actually looks like, her one voice clip wasn't enough! I am trying so hard to stop buying these things, but they find a way to pull me back in every freaking time. I'll have to see them all first, but the only one I can see myself getting this time is probably KH3 Sora. I might get his Monster Form as well, because we may not get many more figures of that form like Sora2016 pointed out. Plus Funko's original line of monster POPs are actually really cute, so I can only imagine what Sora's will look like. I just want more Mystery Minis. I would love it if we got a second wave that focused on the KH3 versions of the characters or Organization XIII. I still think Donald and Goofy are getting new outfits! If this rumor is true, then I just feel like that furthers that idea! Their toy form outfits are very different to their normal ones, while Sora's toy form looks very similar to his normal KH3 clothes. Really hope these pops aren't US exclusive like the KH Tron pops. Really can't wait to see these pops. Very curious about Donald and Goofy since they don't have new clothes. I'd be more excited for a KH3 Riku pop though. The good thing about Marluxia returning in KH3 (and other characters like TAV, Namine, likely Ansem the Wise, and so on) is that they'll be more likely to get pops sooner rather than later, since KH3 will likely take attention away from the past games for the KH pop line for a while. I wonder if they're also in their monster forms but weren't specified as such? Since there were two Soras, maybe they had to distinguish between them but didn't feel the need to for Donald and Goofy? That's my only guess, otherwise I really have no idea what they could be. New poses alone wouldn't be worth it to me. I'm surprised that there's yet to be Kingdom Hearts Nendroids. They'd look absolutely amazing and sell like hotcakes! I hope youâ€™re right. Maybe we go somewhere between Monsterâ€™s Inc and Toy Story where theyâ€™ll get new outfits? I know they said Hercules, Toy Story, and Monsterâ€™s Inc are in the first round of worlds, but Twilight Town is also likely to be right after Hercules. So maybe thereâ€™s yet another original world that will be in the first round of worlds? I would love some S H Figurarts or PAK of Org XIII members. That would be so great. Same here! Now that Good Smile Company is making quite a few Disney Nendoroids, I keep praying that they'll eventually make a Sora figure. They probably won't due to licensing reasons, but I would love for them to do KH eventually! I guess Bandai and Good Smile make some of the same licenses, but I feel like the SH Figuarts is the first time they have given the license to anyone like that. But yea with Nedoroids making multiple Disney figures now it is possible. I do love Nendoroids tho I only have one....I do sorta think they are a little overprices tho. Hence why I don't get them often ha. I'm just hoping Bandai keeps making characters SE hasn't deemed worthy enough for Play Arts or now Bring Arts.... like how did it take this long for us to get high quality Donald and Goofy figures? I really think D & G's outfits in Toy Story can be explained by the fact they were designed by someone else. The Pixar employee probably wanted them all to look like the were in the same toy line, hence why those two were changed more to match Sora. But youâ€™re probably right. I just think itâ€™s a shame they didnâ€™t take advantage and give them new clothes based on those designs as they look more KH3 than the old ones do. I mean, I also would love to switch the two worlds as I think its super weird to have both worlds that change their forms to be back to back at the beginning of the game. And I also want my bois Donald and Goofy to get new outfits as well, but yeah it just kinda seems like they won't be again. Anything is possible I suppose, but I just wouldn't get my hopes up ha. The Soldier Heartless is one of the basic recurring enemies. Not surprised to see it might get a pop. I hope it's Vanitas with the helmet but not the silly Organization coat. You're gonna have Daft Punk Organization Vanitas and you're gonna like it. Unless you don't then that's okay. I personally want a helmetless Vanitas. Oh I am definitely getting that Soldier Heartless pop. That was one of the figures I really wanted to get made back when the first pops were leaked. As far as non-human enemies, I think the only other ones I'd consider buying are Darkside, Antisora, Dusk, and Twilight Thorn. And of course Meow Wow and the Bat-thing that are Sora's and Riku's Dream Eaters. I'd rather they focus on characters though. There'll be a regular one, and then a "Vanitas with Black Coat" chase version, exclusively sold at Baskin Robbins. Im happy they're doing KH3 ones, even if this is currently a rumor. I'm honestly very surprised they're doing Vanitas instead of other major villains like Young Xehanort, or the fact that he is the next original character to get one that isn't the SRK trio, but I will gladly accept that aha.